Ooh, swatching! I know, I know, some of us find swatching to be such a burden. We just want to get knitting. I hear you! And as the designer, I'm lucky enough to be the one to set the gauge - all I have to worry about is creating a fabric I like, while you have to match my gauge or do math to adjust the pattern to your gauge. We knitters are mathematicians, aren't we? 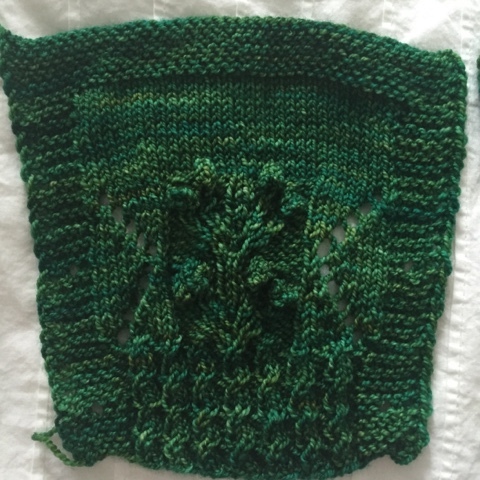 But swatching gives you an opportunity to get to know your yarn, which is a good thing, and it also familiarizes you with the chosen stitch pattern. Since I will be working the cardigan back and forth (no steeking for me on this), I worked my swatches back and forth, too. Hmm, the patterns look OK here with the US6 needle, but I feel like the fabric is too loose. I'm also not loving the Seed Stitch edge. This is more like it! The US4 tightens up the fabric, so everything looks tidy. I know Clara Parkes would want me to go down even smaller, but this is a cardigan that will be worn in August, so it doesn't need to be windproof :) The bobbles look crisper, too. And I am very happy with the garter stitch edges - they give a nice contrast to the smooth stockinette and highlight the hand-dyed color. Previous steps: 1. Yarn choice. 2. Sketching. Next step: Actual knitting! 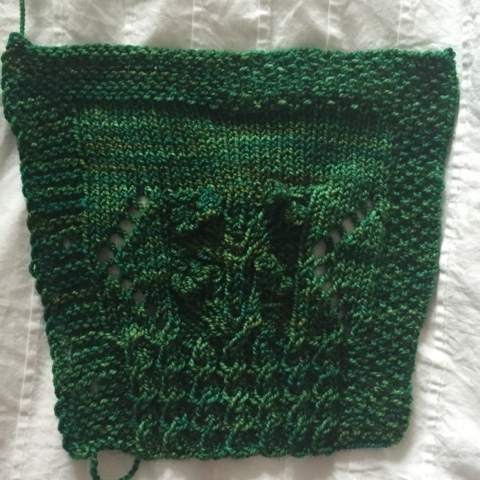 I'll be working my way up the body first, though I might do one sleeve first as a second gauge swatch (and to make the visit to sleeve island shorter because the yoke is always my favorite part). Pattern upgrades coming, well, all summer!